Definition at line 201 of file llvosky.h. Definition at line 224 of file llvosky.h. References mColor, mColorCached, and LLColor3::setToBlack(). Definition at line 233 of file llvosky.h. Definition at line 301 of file llvosky.h. Definition at line 300 of file llvosky.h. Definition at line 302 of file llvosky.h. Referenced by LLVOSky::updateHeavenlyBodyGeometry(), and LLVOSky::updateSunHaloGeometry(). Definition at line 238 of file llvosky.h. Definition at line 245 of file llvosky.h. Definition at line 243 of file llvosky.h. Definition at line 235 of file llvosky.h. Referenced by LLVOSky::getToMoon(), LLVOSky::getToSun(), LLVOSky::initSunDirection(), LLVOSky::setSunDirection(), LLVOSky::updateGeometry(), LLVOSky::updateHeavenlyBodyGeometry(), LLVOSky::updateReflectionGeometry(), and LLVOSky::updateSky(). Definition at line 240 of file llvosky.h. Referenced by LLVOSky::getToMoonLast(), LLVOSky::getToSunLast(), and LLVOSky::isSunUp(). Definition at line 295 of file llvosky.h. Referenced by LLVOSky::updateHeavenlyBodyGeometry(), and LLVOSky::updateReflectionGeometry(). Definition at line 298 of file llvosky.h. Definition at line 283 of file llvosky.h. References f, llmax(), llmin(), mHorizonVisibility, and mVisibility. Definition at line 279 of file llvosky.h. Definition at line 291 of file llvosky.h. Referenced by LLVOSky::calcBrightnessScaleAndColors(), LLVOSky::calcInScatter(), LLVOSky::calcRadianceAtPoint(), LLVOSky::calcSkyColorInDir(), and LLVOSky::calculateColors(). Definition at line 253 of file llvosky.h. References mColor, mColorCached, and sInterpVal. Definition at line 304 of file llvosky.h. Definition at line 305 of file llvosky.h. Definition at line 281 of file llvosky.h. Definition at line 250 of file llvosky.h. Definition at line 287 of file llvosky.h. Definition at line 248 of file llvosky.h. Definition at line 241 of file llvosky.h. Referenced by LLVOSky::calcBrightnessScaleAndColors(), and LLVOSky::initSunDirection(). Definition at line 237 of file llvosky.h. Referenced by LLVOSky::initSunDirection(), and LLVOSky::setSunDirection(). Definition at line 246 of file llvosky.h. Definition at line 244 of file llvosky.h. Definition at line 236 of file llvosky.h. Definition at line 294 of file llvosky.h. Definition at line 297 of file llvosky.h. Definition at line 280 of file llvosky.h. Definition at line 292 of file llvosky.h. Definition at line 251 of file llvosky.h. Definition at line 306 of file llvosky.h. Definition at line 307 of file llvosky.h. Definition at line 282 of file llvosky.h. Definition at line 288 of file llvosky.h. Definition at line 210 of file llvosky.h. Referenced by getAngularVelocity(), and setAngularVelocity(). Definition at line 206 of file llvosky.h. 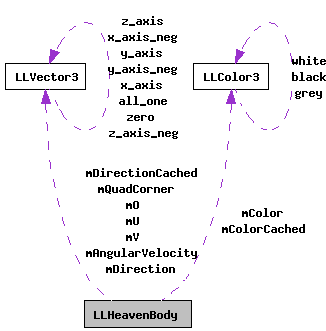 Referenced by getColor(), getInterpColor(), LLHeavenBody(), renewColor(), and setColor(). Definition at line 207 of file llvosky.h. Referenced by getColorCached(), getInterpColor(), LLHeavenBody(), renewColor(), and setColorCached(). Definition at line 209 of file llvosky.h. Referenced by getDirection(), renewDirection(), and setDirection(). Definition at line 204 of file llvosky.h. Referenced by getDirectionCached(), and renewDirection(). Definition at line 212 of file llvosky.h. Referenced by getDiskRadius(), and setDiskRadius(). Definition at line 213 of file llvosky.h. Referenced by getDraw(), and setDraw(). Definition at line 214 of file llvosky.h. Referenced by getHaloBrighness(), getHorizonVisibility(), and setHorizonVisibility(). Definition at line 208 of file llvosky.h. Referenced by getIntensity(), and setIntensity(). Definition at line 221 of file llvosky.h. Definition at line 218 of file llvosky.h. Referenced by corner(), and corners(). Definition at line 219 of file llvosky.h. Referenced by getU(), and setU(). Definition at line 220 of file llvosky.h. Referenced by getV(), and setV(). Definition at line 215 of file llvosky.h. Referenced by getHaloBrighness(), getVisibility(), and setVisibility(). Definition at line 216 of file llvosky.h. Referenced by isVisible(), and setVisible(). Definition at line 217 of file llvosky.h. Referenced by getInterpColor(), interpVal(), and setInterpVal().